Simi: Actually, you're right. 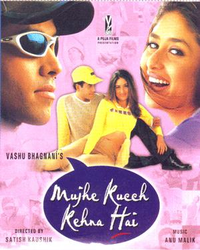 MKKH is a clean family entertainer. Don't miss the ending, though! Mujhe Kuch Kehna Hai is about Karan (Tusshar Kapoor), who is nothing but a Naalayak Aulat, in his dad’s (Dalip Tahil) language. He generally prefers roaming around with his friends other than dreaming of mini-clad girls always.